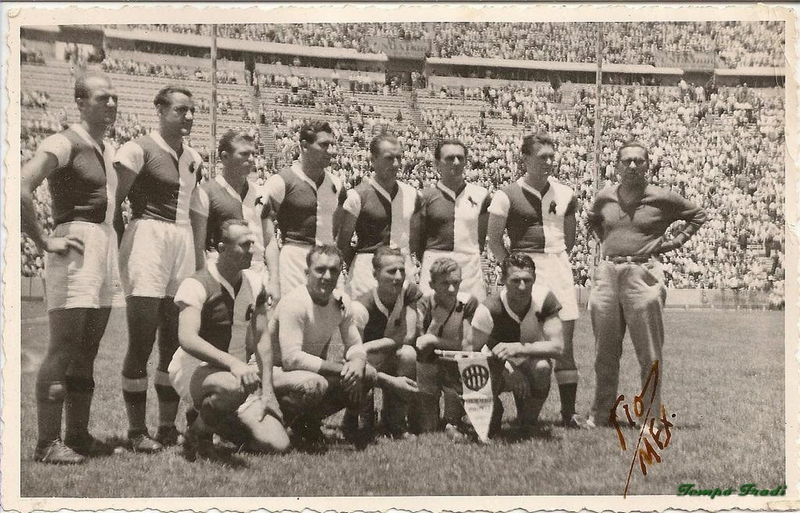 Puskas (top, third from left) lining up with Ferencvaros during Mexican tour 1947. In July 1959, Ferenc Puskas and reigning four-time European Cup champions Real Madrid stopped in New York City to showcase their version of the world’s game in a pair of exhibition games at the tail end of their South American tour. The sojourn marked the second time that Los Blancos visited America to demonstrate the finer points of the game. It was the club’s first since an exhibition match against Galicia FC in 1927. The games were far from competitive with Madrid winning both stateside games handily. As irrelevant as the games were, the affair’s significance lie in the fact that it was Puskas’ second appearance before the New York City football faithful, and his first stint in America since a largely forgotten and unlikely appearance as a member of Ferencvarosi TC (Ferencvaros) twelve years earlier. Before the Hungarian Revolution and his subsequent defection, Puskas had been renowned throughout Europe as “The Galloping Major.” He was a national idol within Hungary and the personification of Hungarian football with both his club, Honved, and the national team. He undoubtedly always gave his best for the nation, even when it meant displaying the best that Hungarian football had to offer by donning the colors of rival club Ferencvaros in New York City and throughout the club’s Mexican tour of 1947. Prior to World War II, Hungary was one of the most competitive footballing nations on the European continent, having shown well during the 1934 World Cup and finishing as runners-up in the 1938 rendition. The central European nation also housed two of the most formidable clubs in Europe at the time in Ferencvaros and MTK Budapest. The country’s superb footballing tradition continued following the cessation of war through to the 1960s. Its entrance into the Warsaw Pact in 1949 ushered in window of army-backed Honved dominance that lasted until the Hungarian Revolution ending the dominance of Ferencvaros. 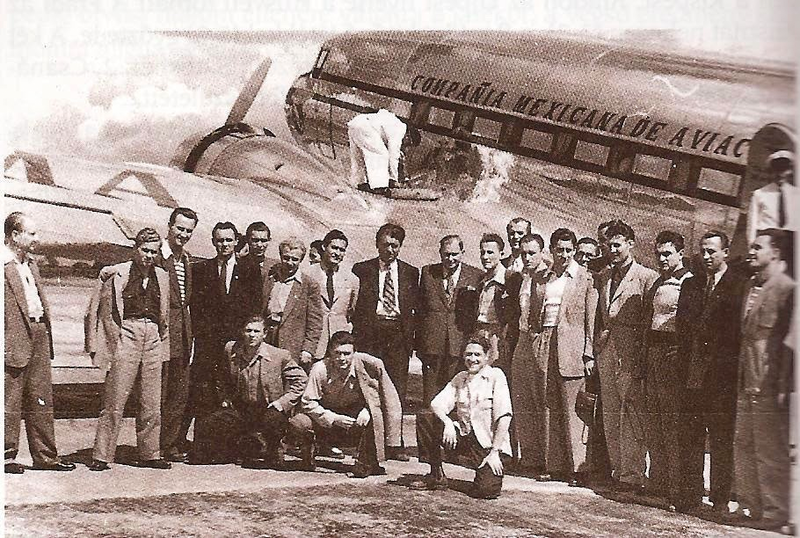 Ferencvaros during their tour of Mexico. Puskas kneeling far left. This interval coincided with the rise of one of the world’s greatest footballers in Puskas, who made his national team debut in 1945 and quickly became a known quantity within world football. It was during this period – before the Communist takeover of Hungary – that the country’s most decorated club, Ferencvaros, embarked on an expedition to Mexico for a small payday and a series of games against some of the best Mexican clubs and the Mexican national team. In an effort to exhibit the best of Hungarian football, Ferencvaros enlisted the services of Puskas and Ferenc Szusza to compliment the club’s lineup that featured a who’s who of Hungarian talent including: Gyula Lazar, Gyorgi Sarosi — the lauded star of the 1938 World Cup — and Geza Henni — future U.S. Men’s National Team and Houston Stars coach. After a one-off game in Brno, Czech Republic, Puskas, and his seasonal teammates flew across the Atlantic stopping in New York City en route to Mexico. In just twelve hours inside the city, the visiting Hungarians marveled at the foreign sights. They noted their journals, “We have seen the streets of millionaires.” (Note: both Gyula Csikos and Dr. Lakat Karoly kept diaries during the tour, but due to difficulty in translating the text from Hungarian it is difficult to discern who’s diary it is from.) They vowed to come back after their Mexican jaunt, where, on July 16, they were warmly received in Mexico City by a significant gathering of Hungarian émigrés who greeted the club with a banner reading “Welcome Fradi,”alongside a band and mass of journalists. Ferencvaros sightseeing while on tour. Note Puskas kneeling with cowboy hat. For the next few weeks, in addition to the eight games on their schedule, Puskas and Ferencvaros traipsed around Mexico taking in all the country had to offer, from cuisine to culture, all the while visiting with doting Mexican dignitaries and Hungarian expatriates. Within those weeks, while followed sparingly by the American media, the Hungarian club compiled a record of three wins, two draws, and three losses, with both Puskas and Szusza contributing to the cause. The group concluded their stint in Mexico with a heartbreaking 4-3 loss to the Mexican National team on August 17. The loss came just two weeks after Ferencvaros drew El Tri 3-3. Both guest players notched a goal in the loss. Their collective best was yet to come and soon to be on display in the United States. With the bulk of the tour behind them, and, in truth, all but over, the whole of Ferencvaros was in New York City for one last payday on August 20. The team congregated at the George Washington Hotel in Manhattan before heading out to the Hungarian Garden Restaurant for lunch. There the city’s Hungarian population enveloped the players with praise and song singing of the beauty of their homeland. In attendance, to the delight of the team, were two of their country’s celebrated sportsmen: Antal Kocsis, 1926 Olympic flyweight gold medalist, and Lazlo Sternberg, captain of the 1934 Hungarian World Cup Team. Once the team were in New York, American media were sure to praise the visitors as well. Most of the the attention focused on Gyorgi Sarosi. “Hailed as the all-time greatest inside left by the London Daily Mirror,” proclaimed The Leader Observer – a position he would not even play in New York. Coverage of Puskas, aside from projected lineups, was nonexistent. He had yet to build his legend and dazzle audiences across Europe, and for the purposes of his New York visit, the press treated him as just another member of the squad. That would change tremendously upon his return visit with Real Madrid. 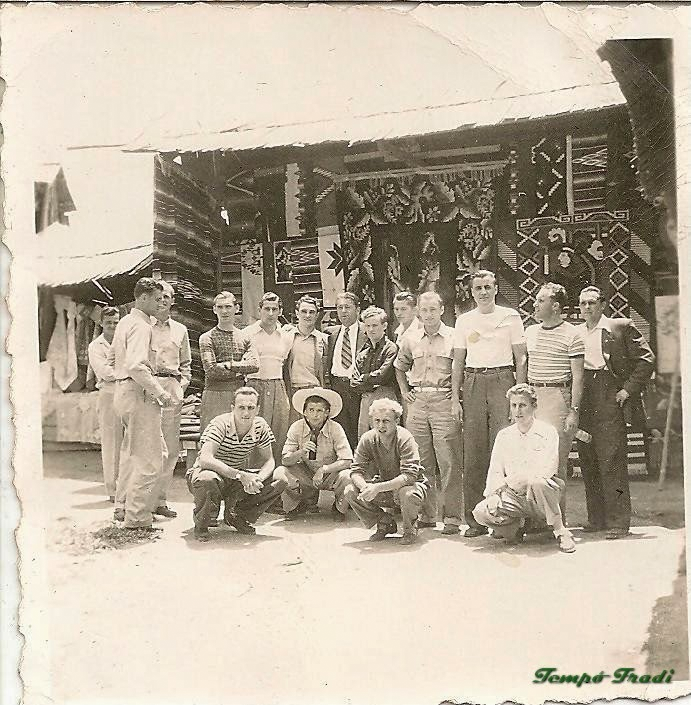 After an entire day of feting and sightseeing, the men woke up the next morning to repeat the actions of the previous day as they went shopping for anything that they could trade for profit back home prior to their game with the New York Hungarians of the National Soccer League. That night, in the presence of the Hungarian consul, with Puskas lined up in his customary inside left position, Ferencvaros took the field in front of over 3,000 fans in their sole appearance in the United States. Across the field stood a familiar face in Lazlo Sternberg who lined up at fullback for the New York Hungarians. The game kicked off under the lights of Dexter Park at half past eight o’clock. 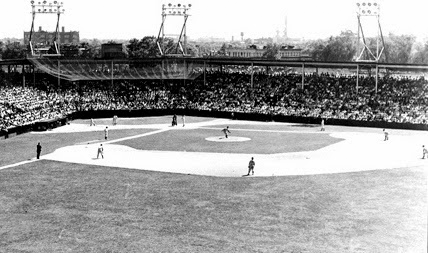 Though impressed with the lighting, the dimensions of the field greatly confounded the visitors due to its primary configuration for baseball. Dexter Park view from outfield during a baseball game. Photo courtesy of covehurst.net. That confusion, coupled with fatigued legs due to jet lag, allowed the hosts to pounce on Ferencvaros early as either inside right Adamcyk, or center forward Bela Gyurtsak (the sources differ) put the New York club up 1-0 with just nine minutes gone. The goal and its goal scorer mattered not, as just minutes later the famed Sarosi leveled the match at 1-1. Jozsef Meszaros put the visitors up for good later in the first half. The game entered halftime 2-1 in favor of Ferencvaros. The hosts held firm in the first few opening minutes of the second half, but soon fell victim to the blistering attack of the visiting Hungarians who absolutely put on a clinic in the second half winning the game 12-1. Puskas was unable to find the score sheet and ultimately yielded the field to a substitute. It did not matter however, as the future Honved and Real Madrid mainstay found ways to contribute to the club’s victory in his first visit to the United States. Following the 12-1 drubbing of the New York Hungarians, Ferencvaros flew back to Hungary to take part in the Hungarian domestic league, where both Puskas and Szusza returned to their respective clubs in Honved and Upjest. All but the most ardent Ferencvaros supporters inevitably forgot the tour. For American soccer fans, it remains a long forgotten game played at a ground that no longer exists, although the Hungarian club would further aid in the development of the game within American when it made its returned to the United States in 1965 and take part in the last rendition of the International Soccer League. Puskas’ return with Real Madrid in 1959 proved to be a more notable and lively affair for the “world’s most famous Hungarian.” Instead of playing a bit part on a team that wasn’t his own while in New York, Puskas was a key contributor in Real’s two game stroll in 1959 scoring two goals in a 6-2 victory against Austrian side Graz AK and a hat-trick against a Graz and New York Hungaria amalgamation. That tour, too, remains a footnote to the larger history in Puskas’ career that came to define a generation of Hungarian football and cement a legacy as one of the greatest ever. In writing this article, I, as always, relied on multiple sources and Google translate. My primary sources consisted of The Brooklyn Eagle, The Leader Observer, The Long Island Star Journal, The New York Times, and the journals of Gyula Csikos and Dr. Lakat Karoly made available by the the wonderful people at www.tempofradi.hu. A big thank you Laszlo Lakatos and Karoly Horvath for their work on the website and help in guiding me toward these journals. Google translate does not do the work justice and left much to be desired in terms of literal translation, which ultimately led to a lack of accurate quotes that are usable. Nonetheless, Google translate gets the story across and allowed me to fill in holes in the American coverage of the tour. In addition to the sources mentioned, I consulted numerous other sources including: David Goldblatt’s The Ball is Round A Global History of Soccer, the RSSSF Archive, and the American Soccer History Archives. Great article. We would love to assist you with the Hungarian transcripts as we have multilingual staff here. There are also references in Puskas’ biography which is in Hungarian.